How do aesthetics reflect ideology? What does the formation of an alternative narrative look like? 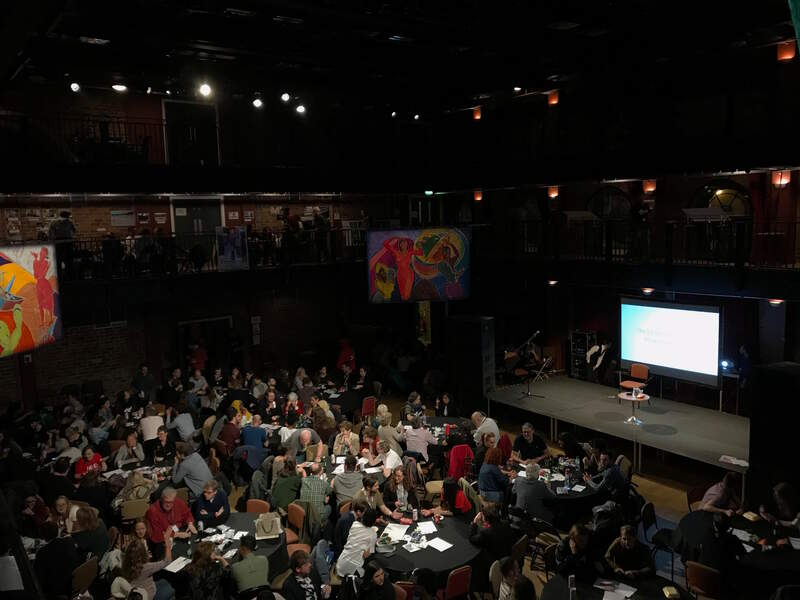 The recent The World Transformed (TWT) festival in Liverpool visually revealed the establishment of a new hegemony on the left. TWT was primarily split between two main locations – The Black-E space and the Hinterlands venue. The Black-E is a former 19th century chapel transformed into a contemporary art and community centre. Upon approaching up the stone stairs lining the front of the historic building, you enter a dark and damp rotunda. Two symmetrical staircases line the barren walls leading to the main space. Entering the main venue, you are immediately struck by the expansive verticality of the space. Two levels of balconies line the walls above. An impressive fabric collage hangs from the balcony opposite the entrance announcing – ‘Capitalism Is Crisis’. Beneath the proclamation is a timeline with specific dates in the history of socialism and popular mobilizations, interrupted by illustrations of Marx, women’s suffrage, the NHS, Martin Luther King, and ending with Corbyn and his shadow cabinet. The tone for the four day festival is set – this is no ordinary political conference. When the events begin, the lights slowly dim, and an aura surrounds the space. Lights focus on the banners hanging from the mezzanine, including various colorful figures adjacent to the explicitly socialist banner. For many of the talks, the participants sit at circular tables – establishing a notion of camaraderie that attempts to break free of the hierarchical structures that predominantly encompass an event regarding political speakers. At night the space becomes particularly comforting – the dimly lit spotlights no longer have to compete with the natural light. The venue becomes both a refuge for challenging the dominant ideology and proposing a truly new and radical alternative. The second hub of the conference was located about a ten minute walk away at the Hinterlands venue. The journey along the highway dichotomously reflected the human potential for inspiring architectural feats on one hand and the ability to systematically inflict incomprehensible acts of terror on the other. On one side, the monolithic Liverpool cathedral loomed above, while when you faced the other direction, you were met with a wall of wooden construction panels pasted with the thousands of names of refugees that died in their futile attempt to reach Europe. The experience marked both a spectacle of grandiosity and a blatant demonstration of the modern asymmetric value of human life. The Hinterlands space is located in the old Cain Brewery site. The surrounding environment has been transformed into an eclectic and versatile arrangement of art spaces, food markets, and bars. The former industrial area simultaneously reflects a desolation and the potential for a creative and progressive resurrection. The space was a perfect fit for the ideology of the festival. The bare framework of the building illuminates a raw energy, that analogously matched the atmosphere of the festival which encouraged untarnished emotion. In the main event space red cloths lined the ceiling. A set of wooden stadium style seats were placed in the back corner, where spectators casually lied down and socialized during some of the events. A banner alongside the space read ‘The Sun Not Welcome Here’ in reference to their coverage of the Hillsborough Massacre. Below it – ‘University as Factory No!’ signifying a continuation with the sentiment expressed during the university strikes across the UK earlier this year. Beside the stage, a red fisted sculpture constantly reminds the audience of the explicitly socialist nature of the festival – critiquing not merely particular policies or politicians – but ideology. The space was cold. Two electric heaters were futilely placed beside the stage. Nothing was superfluous. The stage lacked a traditional ornamental podium. Proclamations came from a white painted wooden block. There were no bottles of fine still or sparkling water on stage, just plastic jugs sent over by various members of the audience. The subversive space lacked assigned seating, allocated VIP sections, or a designated press area. Attendees sat in whichever plastic folding chair they desired – irrespective of their profession, background, or connection with the speakers. Just like the industrial venues – the attendees revealed a genuine aesthetic, not merely actors conforming and abiding by a set of ostentatious constructed social mannerisms that define political occasions. People were dressed in a casual manner: t-shirts, jeans, hiking shoes. The crowd was diverse – filled with a range of people from grey haired union members to recent university graduates. There always seemed to be a person holding a Palestinian flag. The aesthetics of the attendees demonstrated a clash between the establishment and the people. During the final rally of the festival, there was a spectator standing in the balcony, dressed in traditional business attire – most likely a Labour MP or a member of staff. His outfit, while in the main conference hall in the city centre or surrounding restaurants, would have been the norm; in the Hinterlands venue, it conspicuously revealed the unique nature of this political event. There was no immaculate carpeting, comfortable reclined seating, intensive security and bag checks, or assigned seating. People were not wearing lanyards that stated who they were, where they came from – a mere red wristband guaranteed access to all of the events. The environment was not designed to be physically comfortable but merely to provide a space. Establishing a counter narrative is not merely political, but cultural and personal. It depends on creativity and the organization of physical and social space – providing a model for new modes of interaction dependent on a notion of uncompromising inclusivity. As Lefebvre, the Marxist cultural theorist notes, ‘the class struggle is inscribed in space’ – it is reflected in the aesthetics and architectural ordering of an environment. So with this in mind, how did the TWT diverge from the main Labour conference and how does this reflect the divergence in ideologies that are being challenged within the party? Upon walking to the main conference, you are met with an extreme and truly absurd security apparatus. Overt military like structures were erected to ‘protect’ the conference – bollards, fences, and an array of white tents – a militarization of the public space. The event took place in a typical establishment political environment. If you had the right accreditation you were treated with a general degree of comfort and respect. If you did not have the right identification, entering was nearly impossible. While both events occurred in seemingly physical proximity to each other, they reflected an ambience that was entirely divergent – one radically egalitarian and the other the epitome of the status quo. What does a revolutionary movement look like? In the case of TWT it is raw, minimal and open – that generates an energy which made me feel that I was witnessing history before my own eyes.